Siamo lieti di rinnovarVi l’appuntamento con il Vinitaly 2019, la più grande manifestazione dedicata al mondo del vino. Dal 7 al 10 aprile nella sede di Verona Fiere, la storia, i profumi e i sapori dei più pregiati vitigni siciliani saranno a Vostra disposizione all’interno del nostro Stand n. 45, Corridoio C, Padiglione 2 (Sicilia). We are so glad to renew our yearly appointment at Vinitaly 2019, the biggest wine event. 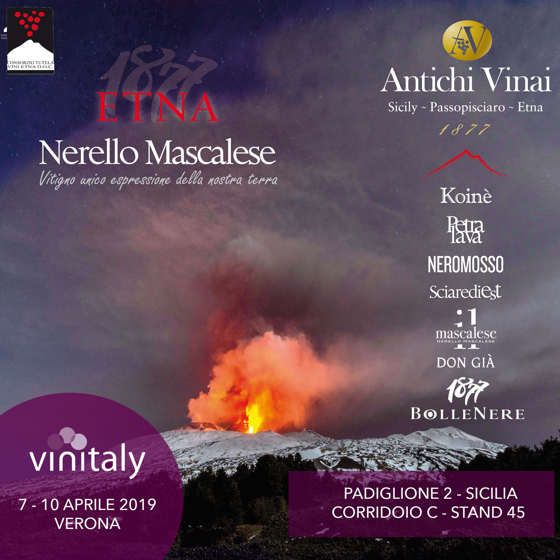 From the 7th to the 10th of April, at Verona Fiere, the history, aromas and tastes of the finest vine varieties from Etna and Sicily will be at your disposal in our Stand n° 45, Corridor C, Hall 2 (Sicily). Four days to transform every wine glass in a tasting of the culture and history of Etna; four days to discover our latest news and our best wine awarded by prestigious awards. Our rare and precious grapes are hand-picked in order to maintain their integrity. For over four generations, the Gangemi family takes care of their products with passion and expertise to offer the best to the best Sicilian wines fans who know Mount Etna as one of the best enological terroir.